The Spanish who wants to overcome 254 km / h on some skis: "How can I not be afraid?" Jan Farrell (Lancaster, United Kingdom, 1983) tries to calm down. Breathe once. Breathe twice. Breathe three. He wears long, heavy skis, an extreme time trial helmet and a latex monkey with ailerons in the cufflinks: what he's going to do is not normal. It is on top of a hill in Vars, in the French Alps, and in a few seconds, it will jump, turn 90 ° in the air and plunge into the abyss. What sport, what madness. A descent of more than 1,200 meters awaits with a maximum slope of 98% at the beginning - that is, a wall - and an average slope of 52.5%. Will approach the 230 kilometers / hour, if everything goes well will exceed them and if everything goes too well beat the world record: 254.9 km / h. What do you feel in that delicate moment, just before rushing towards nothingness? «I feel fear, why not? Nobody can get used to something like that. I think: 'What am I doing here? ', 'Why am I not at home with my family? ', 'This time will be the last', and so on. Many times I look at the descent and I only see the end, the slope covers part of the path. It is scary, but I must know how to manage it, I must know how to calm down. Before launching, it is very important that I control my pulsations. If in full decline I panic I could make a mistake and suffer very serious consequences. So I just have to breathe, jump and do what I have prepared to do ». Farrell practices speed skiing, of very high speed. Without a motor, without help, whoever registers the highest top speed in a timed section of 100 meters at half descent wins. It's that simple and that complicated. From a Czech mother and an English father, both philologists, at four years old her family moved to Spain from the United Kingdom and at seven she settled in her current city, Alcobendas, from where she discovered the modality. Interested first in alpine skiing, like most practitioners, he soon got bored with so many turns, saw some skiers go straight and what he did. In 2011 he made his debut in competition and in 2015 reached the top category of the World Cup to get his best result last year: a fifth place. In the season that starts this week in Salla, in Finland, he wants more: he wants to win, he wants the world record. "Indescribable" sensations await you. «Up to 200 km / h, skiing. From there, you do something else: you flow, you feel. The key is to absorb the irregularities of the ground with the body and, at the same time, to maintain a posture that is as compact as possible, aerodynamic. It seems easy, but it is not, at all. It takes a lot of strength, a lot of concentration. I lose my senses For example, in full descent I do not hear anything. I know that there is a very sharp noise because once I placed a microphone in the helmet and because the spectators say that it is as if it were flying over a fighter, but I do not hear anything. And I almost do not see either. I'm too focused. It's weird to say it, but it's a quiet moment, it's seconds that seem like minutes, it's very difficult to explain ». As you can imagine, your sport has a very high risk: there have been deaths. Falls are rare, but when they occur it is almost impossible to escape unscathed. Burns and bruises are the minimum possible toll. And that's why Farrell can consider himself lucky. In his entire career he only fell once, in Vars, in 2016, at 216 km / h, and had hardly any consequences - in fact he competed the next day - although, yes, it took more than a year to heal the wounds psychological The descents were made uphill. "I thought I would be strong to overcome it, but it was more complicated than I thought. I had fear in my body and it was impossible for me to calm down. I had to go to a sports psychologist [ Ricardo de la Vega ], who helped me to get to know me better and to work under stress. It stressed me a lot, put me to the test and I learned from that process. Now I accept that the fear will be there, but I have the tools to manage it. At the beginning of April, when I return to Vars, which is the best-known test of the World Cup, where higher speeds are achieved, I will have to remember the fall and overcome it. This is what I am passionate about and I want to continue doing it ». And to do it, in addition, you do not have to spend the bad drink that is for any minority athlete to balance the accounts. In his case, one of the most typical questions - "And all this how do you pay for it?" - loses its meaning. At age 18, after inflating his moneybox by arranging the mobile phone to his friends, he founded the Liberalia company and today is its CEO, with 45 employees on the payroll. 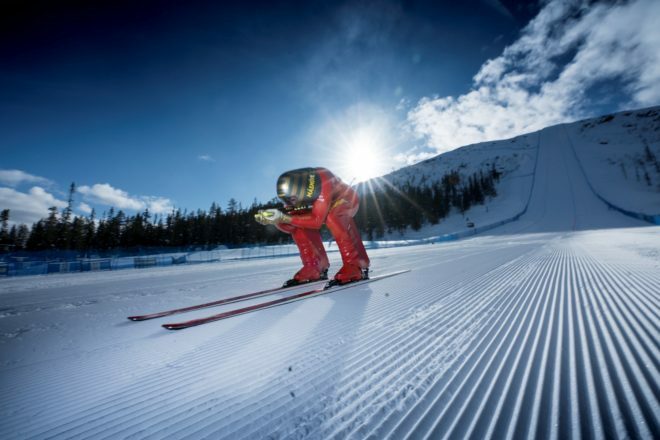 The many expenses generated by speed skiing are not a problem for him and, moreover, it is not uncommon for him to pay for tests or even a whole season for other skiers. For example, Juan Carlos Sánchez , from his same club - the Amistad Club of Madrid - fourteenth in the World Cup last year, started with his help. «Juanqui is a natural, his is instinct. I need to control everything to the millimeter: I test my material in a wind tunnel in Cambridge, I measure my physical preparation - together with the trainer Alejandro Gómez has designed a specific plan for speed skiing - he gets it in another way. My idea with him and with others, like Paris Arroyo, is to create a school. This sport is not easy. The closest track to train is in Andorra, in Grandvalira, and you have to travel a lot. Help is needed. I would like there to be many Spanish skiers when I leave it. It's something similar to what Ander [Mirambell] has done in the skeleton, "Farrell concludes.